Directors: Frederick Sullivan (the first 10 episodes); Howell Hansel (the episodes from No. 11 onward, plus assistance with certain of the earlier episodes, especially Episode 1). James Durkin also participated. Scenario: Lloyd F. Lonergan, episodes 1 to 10; Francis W. Doughty, episodes 11 onward (Doughty was called in on an emergency basis to "straighten" the script, which was considered to be a disaster); the initial episodes were from a story by Daniel Carson Goodman, subsequently novelized by Harold MacGrath. Doughty may have participated from Episode 8 onward, when the theme was changed. The Library of Congress copyright records name Howell Hansel as author of episodes 10 and onward, with F.W. Doughty credited as author of certain episodes; it is believed that Hansel did no script writing but acted as director. Notes: 1. This serial was produced by the Thanhouser Film Corporation, New Rochelle, New York, and distributed by the Thanhouser Syndicate Corporation, 71 West 23 Street, New York. 2. "In the cast are 1,000 American people," noted a Thanhouser advertisement in Reel Life, October 24, 1914. 3. The first eight episodes were advertised as Zudora. 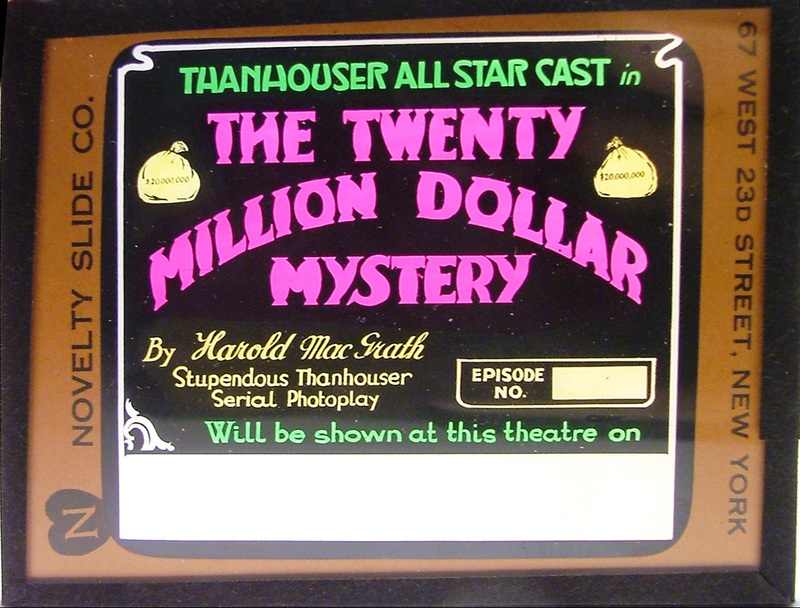 Beginning with Episode 9, the title Zudora in The Twenty Million Dollar Mystery, also in print as Zudora in The $20,000,000 Mystery, was used. Later, Zudora in was dropped, and the serial was known as The Twenty Million Dollar Mystery. 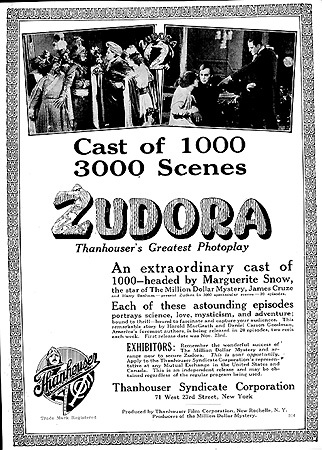 In some newspaper serializations, the "Zudora" title was maintained for a longer time; for example, in The New York Globe and Commercial Advertiser, the title appears for the first time as Zudora, or The Twenty Million Dollar Mystery on March 8, 1915 with Episode 16. 4. The film leaders on early episodes seen by the author have this message: "Zudora is a remarkable continued photoplay of twenty consecutive episodes each complete in itself. The central plot carries throughout the serial an extraordinary recital of adventure, love and mystery." 5. In various synopses, Madame Duval's surname was printed inconsistently, with other forms including du Val and DuVal. 6. The Twenty Million Dollar Mystery was edited by Jesse J. Goldburg and was reissued as The Demon's Shadow, in ten two-reel films, on a states rights basis at the rate of one episode per week, by the Arrow Film Corporation, commencing March 1, 1919. 7. A Vitagraph serial feature, The Fates and Flora Fourflush, released in three parts in January 1915, had as a secondary title, The Ten Billion Dollar Vitagraph Mystery Serial, an obvious parody on the Thanhouser production. "Tuesday [September 8th] we will see the decks cleared for action at the studio when Zudora, a forty-reel masterpiece of film construction, will be started under the general supervision of Lloyd F. Lonergan, director of production; Frederick Richard Sullivan, director, and Daniel Carson Goodman, author of the story. It is said to be bigger and better than The Million Dollar Mystery, with a hint of the wizardry of the Orient. Dr. Goodman, it will be remembered, is the author of Hagar Revelly, the book that won its way through the Supreme Court, and with Sullivan and Lonergan as collaborators, the production cannot help but be the best serial yet produced. "In addition to this masterful trio, the incomparable 'Peggie' Snow, 'Handsome Harry' Benham, as the juvenile lead, and Jimmy Cruze as the heavy will bring the theme before the public as only these artists can. All that could be hoped for in mystery will be found in Zudora, and it is a wonderful thing for New Rochelle that so stupendous a serial is to be started worldwide following on the remarkable record the Mystery has and is making...."
"The courtroom scene in Zudora, the new Thanhouser serial written by Daniel Carson Goodman, was taken in the historic building which serves New Rochelle, New York as a city hall. This building, although now it is completely remodeled, dates back to Revolutionary times, and the voices of many famous personages of a bygone day have been heard within its venerable walls. "Critics who have enjoyed an advance view of this scene declare it to be one of the most remarkable courtroom scenes ever shown on the screen. Director Frederick Sullivan has successfully instilled into the actors that attitude of mingled awe and expectancy, which is typical of a courtroom throng when the case before the court is potent with life and death possibilities. Altogether, it is full of atmosphere of unusual dramatic worth." "Harold MacGrath, who novelized The Million Dollar Mystery and selected to novelize the scenario of Zudora, arrived at New Rochelle recently for a conference with his collaborators. Mr. MacGrath, who had previously been in consultation with Dr. Daniel Carson Goodman, the author of the scenario, expressed himself as satisfied at being chosen to novelize the play, with whose early action he was now acquainted. Marguerite Snow and James Cruze will play the leads in the coming serial." "The factory is as busy as a beehive these days and getting out a number of Zudora prints for exchanges. The first release of the serial by Daniel Carson Goodman will be on November 23, upon the completion of the showing of Episode No. 22 of The Million Dollar Mystery. Carl Louis Gregory is making the titles, and the advertising campaign, upon a very large scale has begun. The first big sheet, in lifelike colors, carries photos of Marguerite (Peggy) Snow, Jimmy Cruze, Harry Benham, Harold MacGrath, who is to novelize the story, and Daniel Carson Goodman, the creator of the wonderful series-serial." "Harold MacGrath, who novelized The Million Dollar Mystery, visited the Thanhouser studio at New Rochelle last week to attend a conference on Zudora, the new serial which will follow the Mystery. Dr. Daniel Carson Goodman, the creator of this new wonder photoplay, detailed to Mr. MacGrath some of the early action, and the famous author expressed his satisfaction at being selected to write the novelization of the Goodman scenario. "Mr. MacGrath inspected some of the marvelous sets used in the first episode of Zudora, and renewed his acquaintance with Marguerite Snow, who will play the title role, and James Cruze, who will be Hassam Ali, the Oriental mystic, in the new production, both of whom he first met when The Million Dollar Mystery was launched. 'I expect great things from this new production,' said Mr. MacGrath. 'It is a new construction in photoplay writing and therefore unique. It has a real, definite dramatic tenseness, and I shall keenly enjoy writing the novelization.'" A few pages later, the same issue noted: "Marguerite Snow, in the titular role of Zudora, the new Thanhouser serial, is wearing clothing that totals up to $17,000. And the world has proclaimed 'Peggy' the best dressed woman in pictures. James Cruze is doing fine work in the character of Hassam Ali. It fits him like one of his suits, and 'Jim' is known as a swell dresser on and off." "Zudora, another absorbingly interesting serial, is to be produced by the Thanhouser Film Corporation as successor to The Million Dollar Mystery. Daniel Carson Goodman is the author of the new serial which will be released in two reel episodes, each of which will be a story complete in itself. "Harold MacGrath, who novelized Kathlyn and The Million Dollar Mystery, will write the newspaper version of Zudora. All the newspapers throughout the country now running the Mystery story have taken unto themselves the new serial. Mr. Goodman, through The Escape, The Battle of the Sexes, and The Avenging Conscience, all Broadway successes, has a definite value to the exhibitor booking Zudora. He is admitted to be the photoplay author-genius of Broadway. "In Zudora will be more scenes than in all the plays of the Bard of Avon, a distinction in itself. The title of the first episode gives an idea of the mystic theme on which Zudora is predicated. The Mystic Message of the Spotted Collar, is the title of the first release. A cast of three principals will run through the twenty episodes - they to be supported by one thousand people, a construction never before attempted in photoplay production or for that matter, on the speaking stage. "Marguerite Snow, whose Countess Olga, in The Million Dollar Mystery, has cemented her in the hearts of a nation's motion picture fans, will play Zudora. She is wonderfully fitted for the role, which will give her admirers the opportunity to see this remarkable young woman at her best, the role demanding the complete gamut of emotions and a more definite histrionic ability than is the usual requirement. James Cruze, the reporter-hero in The Million Dollar Mystery, will play Hassam Ali, a weird Oriental character around whose mysticism revolves much of the story. Harry Benham, whose work as a Thanhouser leading man is well known, will play John Storm, the young lover of Zudora. This newest of serials will be presented by the Thanhouser Syndicate Corporation." "Frederick Sullivan, Thanhouser director, who is staging Zudora, established a record last week when he took 30 long scenes in one working day." "Mr. MacGrath recently visited the local studio for a conference on Zudora with Dr. Goodman, the latter detailing to Mr. MacGrath some of the early action, and the famous author expressed his satisfaction at being selected to write the novelization of the scenario. Mr. MacGrath inspected some of the marvelous sets used in the first episode and renewed acquaintances with the leading stars. In speaking of the serial, Mr. MacGrath said to a Pioneer representative, 'I expect great things from this new production. It is a new construction in photoplay writing and therefore, unique. There is a real definite dramatic tenseness, and I shall enjoy writing the novelization.'" "Zudora has announced itself through Thanhouser celluloid clarion for release date, November 23. On this day it will sound the death knell of The Million Dollar Mystery (which should have been sounded long before this) and take unto itself Miss Margaret Snow, James Cruze and Harry Benham to lead it through Hindu magic and mystery. Harold MacGrath will again attempt to construct a vehicle on which Zudora will be conveyed. We hope that he will discover a more pleasing route beset with many more interesting incidents than those of The Million Dollar Mystery." "A colossal success! Zudora - greatest film production ever staged! Crowds, Crowds, crowds - the biggest attendance ever recorded in the history of motion picture theatres is being reported from all sections of America where Zudora is being shown.... Exhibitors are coining money on it; turned away thousands in Toledo! Thousands of people were turned away from the big Princess Theatre in Toledo last Sunday. At six o'clock the house was packed and thousands were waiting to gain admission to see Zudora! Same reports come from New York, Chicago, Milwaukee, Seattle and hundreds of other points!" "'The motion picture actress in stellar roles should have as much joy and satisfaction in creating characters for the screen as do stars of the speaking stage,' said Marguerite Snow, who is Zudora in The Twenty Million Dollar Mystery, commenting recently upon her work. "'I am required to solve mysteries in the new serial, which in themselves are so interesting that it is pure pleasure for me to work out the detail. There are so many thrills written into the action that this keeps me all the while excited to see what is going to happen to me next. I look forward like a child to being whirled away in a racing automobile, rescued from exploding railroad cars, carried across an areaway on a narrow plank, dragged from a horse, and tossed out a window - Oh, I cannot begin to tell what all the other thrills are; but I know there are plenty coming, for a scenario writer always is completely devoid of heart. All he wants is action. He never gives a thought to his long-suffering leading woman!'" "The Thanhouser Syndicate Corporation reports a pleasing steady business for The Twenty Million Dollar Mystery, which now bids fair to surpass the total bookings of its record-breaking predecessor, The Million Dollar Mystery. 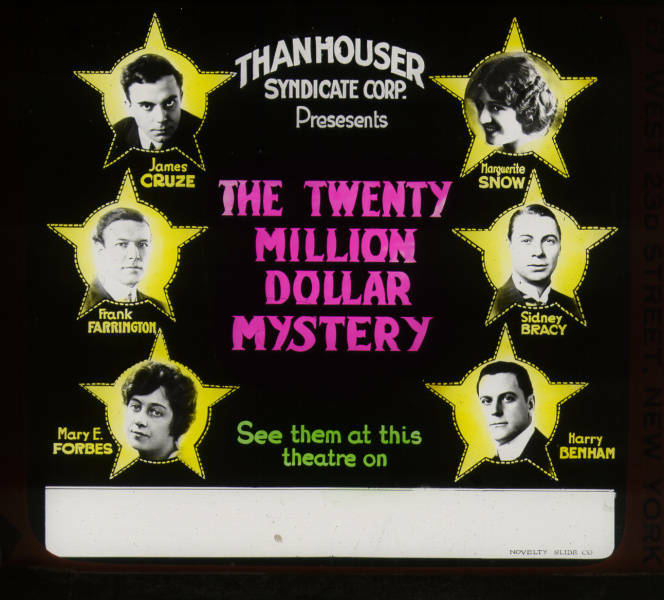 Edgar Shallenberger, vice president of the Thanhouser Syndicate Corporation, recently said that the total bookings, with cancelations deducted, for The Twenty Million Dollar Mystery have passed the $750,000 mark. The popularity of Marguerite Snow, James Cruze, Sidney Bracy, Harry Benham, Frank Farrington, and Elizabeth Forbes in the big mystery serial not only shows no sign of abating but constantly increases. There are many thrilling experiences to thoroughly satisfy the patrons of motion pictures throughout the country."